People gave an estimated £320m in loose change to charity last year, according to a survey published today by the Charities Aid Foundation. The survey of 1,123 people, carried out by the research company YouGov on behalf of CAF, highlights how important coins still are to many charities. Giving loose change remains the most popular form of giving despite the rise of giving online and by direct debit, according to CAF. Sixty-five per cent of women said they had donated loose change, compared with 55 per cent of men. Men, however, said they donated an average total of £20.75 in loose change during a year, compared with £10.76 by women. The survey coincides with an ongoing government consultation on the role of cash and digital payments in the economy, amid forecasts that cash transactions will decline sharply. When the consultation was launched, charities expressed concerns that it might spell the end for 1p and 2p coins, which some in the sector feared could hit charitable giving, but the government quickly appeared to back away from the idea. 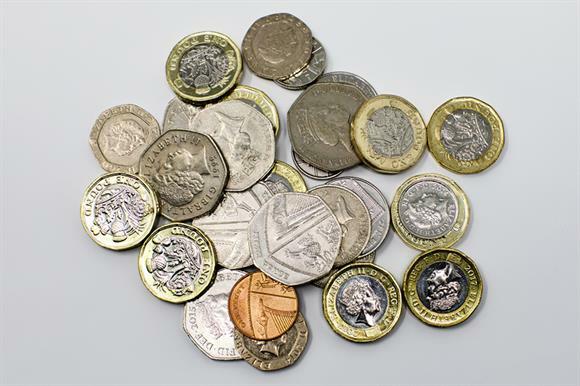 Susan Pinkney, head of research at CAF, said in a statement: "It’s brilliant that people donate millions of pounds a year in loose change – money put into collection tins or spent at charity stalls across the length and breadth of the UK. "But we know that overall cash transactions are falling. So if cash becomes less and less popular in the future it’s vital that the government works with charities and the payment industry to make sure giving remains as easy as tapping a card or putting a few coins in a tin." The Institute of Fundraising is next month due to publish the findings of its survey on payment methods, which will feed into the government consultation. Daniel Fluskey, head of policy and external affairs at the institute, said cash collections enabled charities to strike up conversations with people to raise awareness as well as raise funds. "While it’s important that government recognises the continued value of cash for charitable donations, charities also need to be thinking about future changes and ways that they can encourage donations as people change their behaviour and digital transactions increase," said Fluskey.